Inder Loves Folk Art: Learning curves, cont. On the first try, utterly and totally screw it up. As in, sew the pieces together backwards, or sew them together and realize that four inches needed to be taken out, or sew them together and then realize I had sewn the dress I was wearing into the seam too. Sew again. This time, the pieces were right side out, and my dress is not connected to my project. It just looks like crap on, because it doesn't fit, or has wobbles, puckers, etc. Toss project aside in a huff. Complain to husband and/or housemate that I have only three hobbies, and I'm not actually good at any of them! Waaaaaa! Get pep talk. Next day, try seam ONE MORE TIME. Try on. I hate it, but I'm too tired to redo it. Promise myself I will never sew clothing again. Get another pep talk from husband and/or housemate. Another day passes, I try dress on again, and I realize, it's fine! Who cares if I'm not going to get a medal for "Most Beautifully Installed Zipper"? Move on to next seam. A dozen IPAs* (Racer Five, Lagunitas, and Sierra Nevada Torpedo, thanks for asking), two big spools of thread (that's what happens when you do every seam three times! ), and who knows how many pep talks later, I'm done! Ta da! As worn to work, with practical footwear and without the white gloves. A detail of the fabric and the tucks around the neck. I am really happy with how this turned out. It is indeed, a real dress! It fits, it is comfortable, and I will actually wear it. In fact, I wore it to work today. I had to restrain myself from blurting out to everyone, "I sewed this dress MYSELF!" like a happy little 4H'er. The fact that no one raised an eyebrow and asked, in a supportive, but somewhat concerned voice, "Did you make that dress, Inder?" seemed like a good sign! 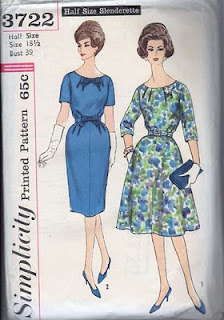 Vintage pattern: I can't remember. I bought it online a long time ago. Fabric: I can't remember, but I have a nagging feeling it might have been kind of expensive, and best forgotten. The fact that I used something that I had been holding onto for years, rather than buying something new, is points in my favor. Therapy: Full cost yet to be determined. Psychological toll on housemate/husband: untold. Of course, amortized out over the next several years, the dress will be a much more affordable $200,000 per wear. So that's a relief. Joseph Roscoe, please keep your soggy Cheddar Bunnies away from this one! * The beer had nothing to do with my mistakes, I assure you. It was used solely for crying into. The dress turned out great! Also, beer is an excellent sewing aid. I've been doing plenty of drinking and sewing this week--box o' wine in the fridge because it is MINE rather than beer which I should not hog because it is OURS. I like to say that once fabric has been in my house for a full year, it's free. Because of sunk costs and all that jazz. It works for me. And that dress clearly works for you. I love it! OMG, you and your dress are both so pretty!